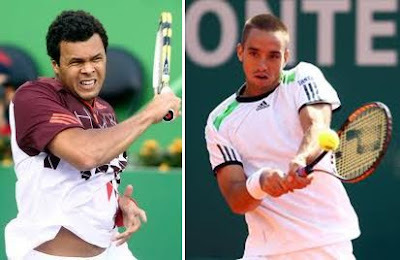 In the series of second round matches at ATP Rome, one of the match is being played between 5th ranked French Jo-Wilfried Tsonga and 29th ranked Serbian Viktor Troicki Tuesday afternoon. Tsonga and Troicki have only met four times in their career since 2008 with Troicki having a winning edge of 3-1 over the French. Tsonga did not have a good start of the year 2012 as of the ten matches played so far by him, he has lost five - the last being at the hands of A. Dolgopolov 7-5 3-6 7-6(2) at Madrid recently. Viktor Troicki too has amiserable record of six losses and four wins in 2012. He last lsot to R. Gasquet 7-5 6-3 in Madrid recently. If we view their track record, nothing substantial can be said to predict the winner. Cany You?